4 July 2018: A beef benchmarking group supported by Farming Together has attracted 50% more participants for its second year of data collection. The HBC beef group project is collecting data from NSW beef farms, seeking a 10% production lift that facilitator Bill Hoffman says could earn the average participating farm an extra $100,000 gross income/year. The project, supported by the successful Farming Together project, saw 23 beef businesses sharing more than 3000 items of data, ranging from stocking numbers to sales figures, total purchases and expenses for the 2016/17 season. These data sets are being used as indicators of farm performance. Mr Hoffman said the exercise will be repeated for 2017/18 and had already attracted 50% more participants. 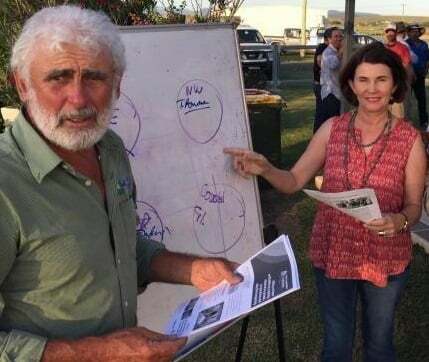 “Whether we measure the responses in terms of more kilograms of beef per ha or per DSE doesn’t really matter – so long as we can have a far more-informed discussion based on data, rather than just thinking we know what’s happening and hoping for the best,” said Mr Hoffman, a NSW DPI veteran before he moved into private consultancy. He was addressing the NSW Regional Outlook conference staged in Casino, NSW by the Australian Bureau of Agricultural and Resource Economics and Sciences (ABARES) on July 4. Also featured at the event was another Farming Together-backed project – Wardell’s Robbie Commens discussed his work with a group of landowners converting cane farms to macadamia orchards. The speakers also included Farming Together’s program director Lorraine Gordon and Greg McNamara, the chair/CEO of NORCO who also heads the industry advisory group for Farming Together. Pictured: Bill Hoffman and Lorraine Gordon.